At home in northern lands from the British Isles to Scandinavia and across Siberia, gnomes are chiefly forest-dwellers, wise in the lore of plants and trees, skilled woodworkers, basket-makers, weavers, and potters, enthusiastic musicians, and caretakers of woodland creatures. 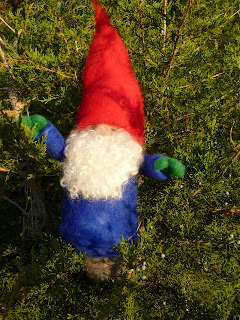 Called Tonttu in Finland, Nisse in Norway, Denmark, and Sweden, and Domovoi in Russia, these small but storied beings live for centuries in snug homes built among the roots of venerable oaks and beeches.Though today gnomes are rarely noticed by lumbering, near-sighted humans—who mostly tend to think of them as nothing more than silly ceramic garden ornaments—gnomes can be great friends to people. In cottages and farms where they are known and respected, gnomes help protect the welfare of livestock, and skillfully aid in the comfortable keeping of the household.Gnome boys receive their tall red caps at a tender age, and keep them all their lives. “A gnome without a cap is not a gnome, and he knows it,” one scholar has declared. 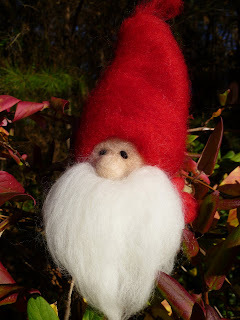 Long beards, blue smocks, and soft felt boots are common to all forest gnomes; but in handsome noses and smiling eyes, each reveals his own character. Many folks are fond of dramatic and exotic animals like lions and cheetahs and pandas, but I’ve always loved the small creatures that have been my neighbors all my life—squirrels, rabbits, foxes, chipmunks, and field mice. I love how they fit into the woods and meadows, and the subtle, beautiful colors and textures of their coats. Their bright eyes always seem so wise. This past Saturday was cool, sunny, and BUSY! I had a table at the annual Finn Spark holiday bazaar in Bethesda, Maryland, filled with needle-felted creatures, books, and cards. Hundreds of folks passed by, and I’m delighted to say that many stopped to cuddle a Tonttu, admire a Joulupukki, and generally enjoy some quality gnome-time. 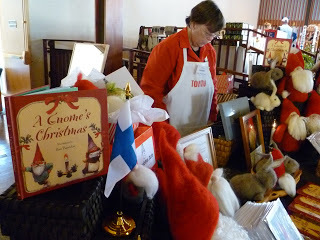 Many of the attendees greeted me in Finnish, a language I haven’t heard since my beloved dad passed away. Lots of folks were in gorgeous traditional Finnish costumes, and many who weren’t were in equally gorgeous handknits. And don’t get me started on the cuteness of the kids! I’m glad I had plenty of gnome post-cards to hand out. Anybody who smiled at my work got a card. By the way, if you’re one of those people who took a card, and you think you might like to add one of my figures to your collection, please feel free to email me, at karenprich@gmail.com, and let me know what you’re interested in. I’d love to hear from you! Welcome to WoolshopArts.com As you have probably noticed, this site is new and in development. Click the "Subscribe" link to be notified by email when new information is posted.